1 As a true friend i have remembered you birthday and i am sending you lovely wishes. As a true friend i have forgoten you age. 2 Congratulation to your 55th birthday. I wish you all the luck of the world, healthiness, success and good friends. 5 Once the candles don`t really fit on to the birthday cake anymore you realize you are turning old. It is getting really tide with 55 candles on top or? 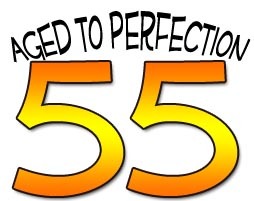 7 It took you 55 years to become as perfect as you are now. Congratulaton to that great result. 8 Life starts with 66 years but you can have a great party at 55. 10 All the best on your 55th birthday. Is someone calls you old now, just throw your third teeth at him and hit him with your walking stick. 12 Congratulations on your 55th birthday.May all your dreams come true and please have a great birthday. Vote for the best wishes!